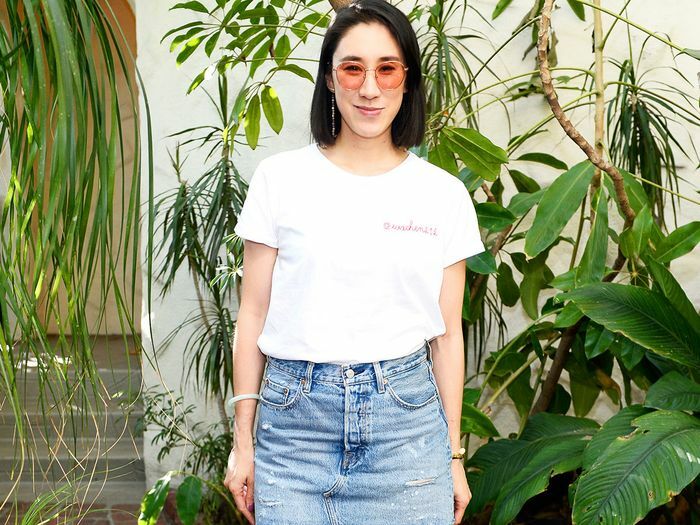 First came Barbie feet, and now Eva Chen is here to call out another posing trend that could easily sweep the nation. Chen (pictured above) is one of our favorite people to follow on Instagram. Not only is she incredibly stylish and authentic, but the director of fashion partnerships at Instagram is filled with great advice, from career to parenting to looking more photogenic. Posting frequently on Instagram comes with the territory when your job is Instagram, so Chen has clearly figured out the secret formula to looking great in photos (no heels required). 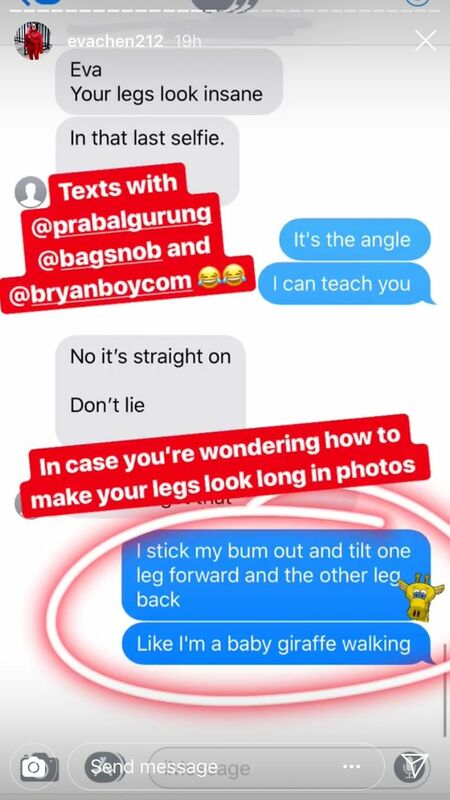 In Chen's Instagram story yesterday, she screenshot a group text with Prabal Gurung, Tina Craig, and Bryanboy (as one does) explaining how she makes her legs look so long in photos. She attributed it to the "baby giraffe pose," saying, "I stick my bum out and tilt one leg forward and the other leg back. Like I'm a baby giraffe walking." A scroll through Chen's feed and other photogenic people's accounts proves that it is indeed a thing, and it could very well pick up where Barbie feet left off once summer comes to a close. Read on to see how "baby giraffe pose" is done by Chen and many more (including an actual baby giraffe). LOLing because two colleagues walked up the stairs behind me, saw me taking this picture, and backed away slowly ???? IDK why it feels so awkward to smile in a mirror selfie but it really does ???? This dress is one size too big but I love the rosebud print so I got it anyway. Needless to say I spent all morning clutching my chest because I kept flashing my teammates ???? The #igselfiemirror is in one of the most highly trafficked areas of our office (the stairs to the cafeteria) so apologies in advance to any hungry coworkers ???? Next up, the posing mistakes photogenic models never make.